They add a subtle scent of the forest floor to your hunting clothes while drying and at the same time help prevent static build-up from attracting lint and hair that may contain odors. Softens hunting clothes to keep them quiet. 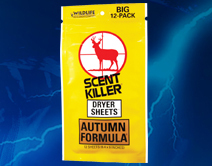 Help prevent static build-up from attracting lint and hair that may contain foreign odors.Softens hunting clothes to keep them quiet.Adds the subtle scent of the forest floor.